Twenty-three days, 90 nations, 102 events and 15 sports made up this year’s Winter Olympic Games in Pyeongchang, South Korea. 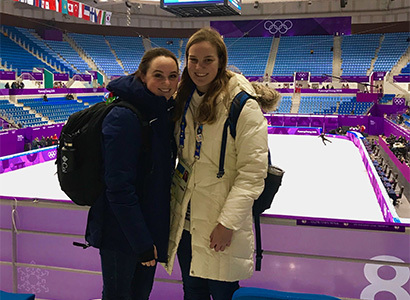 In the midst of the history-making moments, numerous surprises and inspiring action were two students from the Grady Sports Media certificate program, Emily Giambalvo and Cat Hendrick, experiencing the Games in a way few can relate. After a competitive selection process, Giambalvo and Hendrick were selected by the United States Olympic Committee to report on the games for the USOC’s various information channels including its website, TeamUSA.org. Over the course of three weeks, both Giambalvo and Hendrick worked under tight deadlines each producing more than 20 stories covering the different mountain and snow sports. These sports ranged from ice skating to snowboarding, hockey, speed skating, luge, bobsledding and many more. It was a chaotic and exhilarating environment where they not only worked closely with athletes but also with seasoned journalists. “I was way more excited to meet journalists than athletes,” Giambalvo admitted. Throughout this experience, both Giambalvo and Hendrick’s days were filled with traveling to the different sports venues, interviewing athletes and attending press conferences, working in the main press center and writing daily articles. It was not an easy task and each relied on the skills they acquired from their Grady Sports Media classes. This opportunity was made possible with the support of Vicki Michaelis, John Huland Carmical Chair in Sports Journalism & Society and director of Grady Sports. Michaelis was the lead Olympic reporter for USA Today from 2000-2012 and her relationship with the USOC opened the door for students to attend. While Michaelis was a valuable resource and pushed them “to find stories outside of the easy scope,” the Olympics was not without its challenges. Both Giambalvo and Hendrick battled freezing cold temperatures and the pressure to consistently crank out creative stories. 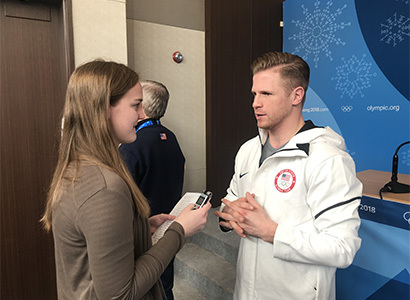 Emily Giambalvo interviewing an Olympic athlete. (Courtesy of Emily). By the end of the games, both Giambalvo and Hendrick walked away with countless memories, stories and experiences.